The blog may have sat idle for a month but hobby things have actually been good overall during September and into October. Whilst it's been nearly 2 months since my last game of 40k I made the decision mid-September to get as much purple paint on my Dark Templar Primaris marines as I could. 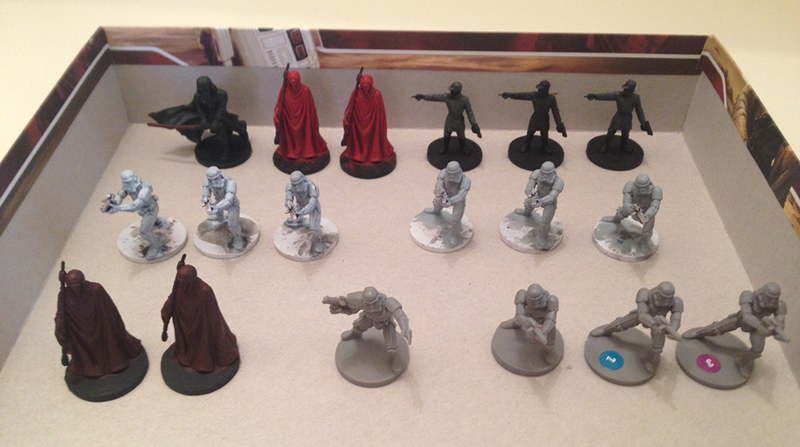 Inevitably this has faltered a little since the arrival of Imperial Assault, but I did manage to get my 7-man Intercessor unit complete but for detailing (above). I'm very pleased with the way I stuck at it through the tedious process of painting space marine armour. 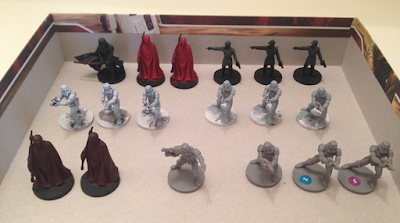 The belle of the ball, however, has been Imperial Assault. It became something of an addiction over the last month, finding new purchases arriving almost every day. We had a demo day at the end of September as part of my annual birthday gaming day, playing the Skirmish version exclusively. I had done my research, mostly watching YouTube videos of others playing the game, but it gave me a good idea of how the game played and even useful tactics and team construction. With something so Star Wars orientated, containing such great character models, I had to start painting them. 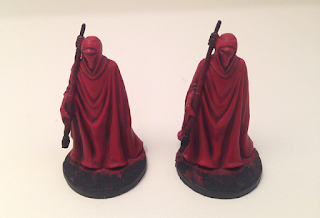 Of course it was the Imperials who found their way to the front of the paint queue first and I've had some fun painting models from the core box. Gaming-wise I've had a total of 4 games now, against 2 different opponents, and the honours are even. My opening game saw a close match against Mr Awdry's Rebels – it came down to the wire and ended when Luke shot Darth Vader in the back (several times) in a very cowardly fashion. Game two saw a tweaked Imperial list face off against Mr Awdy's Scum bounty hunters. Another close game with Vader managing to carry the victory home. My third game on birthday game day saw a first game for Fugs who dropped by to see what the fuss was about. Vader again managed to dominate (and hang on to his last few wounds) for a solid victory. Fugs bounced back this week however with a keenly fought game. My non-Vader Imperial list had fought back from a poor start and the game went down to the wire. Kayn Somos and an Imperial Guard trying to finish off Luke and Gideon Argus. With Argus hiding well away from the fight Fugs pulled off a genius move, playing the Son of Skywalker card at the perfect time, giving Luke 3 consecutive activations without the chance of a response. My Imperial boys couldn't weather that volume of shooting and Fugs got his revenge. It's a brutal game, and it didn't take long for us to get into a flow. There are a lot of special rules, but a fraction of those in 40k or Malifaux, so a couple of games in and we're flying. Next we want to look at the Campaign version of the game, though that looks a might more complicated. I've had a week's break from hobby things now, so looking to jump back in. Looking forward in particular to painting more of my Dark Templar Primaris marines, and maybe even some of my Nurgle! !